Just a few turkeys left! The last chance to order a Midget White Turkey from our farm is here! Click over to HERE for more info or to order. Want to stock up on pasta for winter? PASTA pre-orders are now closed. We will have plenty available at the market on 9/28! We may be occasionally have fresh pasta and bread available over the winter. If you would like to be informed when we do, you can subscribe to our newsletter by clicking right here. Spring is definitely in full swing now. Lambs are bouncing around the pastures, green onions are finding their way into everything we eat, and we’re selling at markets. Six lambs have been born – two sets of twins and two singles – within the past ten days. One last ewe, Zoe, who was our latest lamber last year too, is left to go. Lambs are cute. It is undeniable. They don’t enjoy snuggling the way baby goats do, but I still give them lots of hugs. The latest brood of baby chickens hatched this weekend. We have five mama hens with babies of various sizes running about. One more hen is sitting on eggs, and I think that will be the last we indulge this year. Early May sent us too much rain. The garden was flooded in a few areas, but it seems that we only lost a few potato plants. When the sun came out, though, the whole garden started to grow. It feels like we’re behind in planting – being delayed by wet, wet soil, but tomatoes are in (the most important garden crop! ), and I hope to plant other warm weather items this week…peppers, beans, stupid cucumbers. Even though much of the last few weeks was gray and dreary, I was rewarded with the delight of the locust flowers in bloom. Part of our field is covered with black locust trees, and the spring flowers are fragrant and delightful. I love their light, sweet perfume as much as lilacs. One evening, I even saw an Oriole fluttering about the top of a locust tree, enjoying a meal of nectar. For all its work and rain, Spring certainly has some beautiful surprises. Bill is in the kitchen making breakfast of farm-fresh eggs with some goat cheese we froze last summer, and a few stalks of asparagus that didn’t notice we tilled up their bed to make room for carrots. The land is really starting to turn green in a significant way. We’ve been rotating the sheep and goats through a couple different pastures now that there is enough food to keep them busy for a few days. No lambs yet (soon?? ), but the three goat kids are growing strong. The main garden is still a bit bare. There are wee cold-tolerant plants (kale, beets, broccoli, lettuce) in a few rows, and many succession plantings of radishes. I hope the first ones will be ready for our first market on May 5! Today I’ll be planting even more radishes and beets, as well as transplanting onions and leeks. Most of the exciting stuff is currently contained in the greenhouse. Cabbages abound! We’ve been snacking on bok choi for a few weeks (it’s a healthy and yum addition to pizza, eggs, and stir fry, or a delicious side dish). We even have our very first tomato buds! There are only four tomato plants potted in the greenhouse, but as addicts, we’ll take whatever tomatoes we can get! 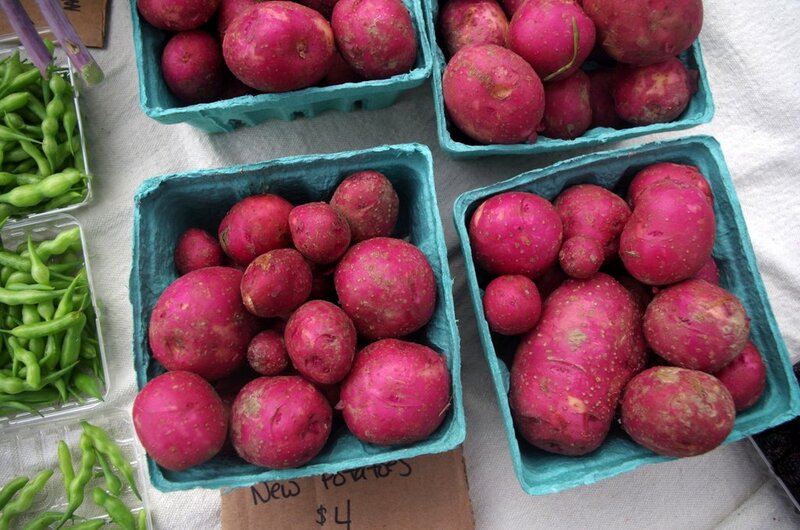 Finally, all our early potato varieties have been planted – about 150 pounds of seed! We’ve put in some old favorites like Red Norland, and are testing some new varieties as well. Hi. I’m JoAnna, and I am a zucchini snob. Before I became a zucchini snob, I wouldn’t touch the stuff. I’d had too many mass-served meals with sides of slimy squash, grown and cooked without love. The thought of eating squash made me squirmy. But then, I tried a Costata Romanesca zucchini and my life was changed. This Italian heirloom variety has amazing flavor (variously described online as “the best flavor,” and “favored for flavor”) and a delightful, never slimy texture. You can recognize it from the light ridges and pockmarks on the dark green skin. The leaves of the plant are also enormous, which is totally fun. 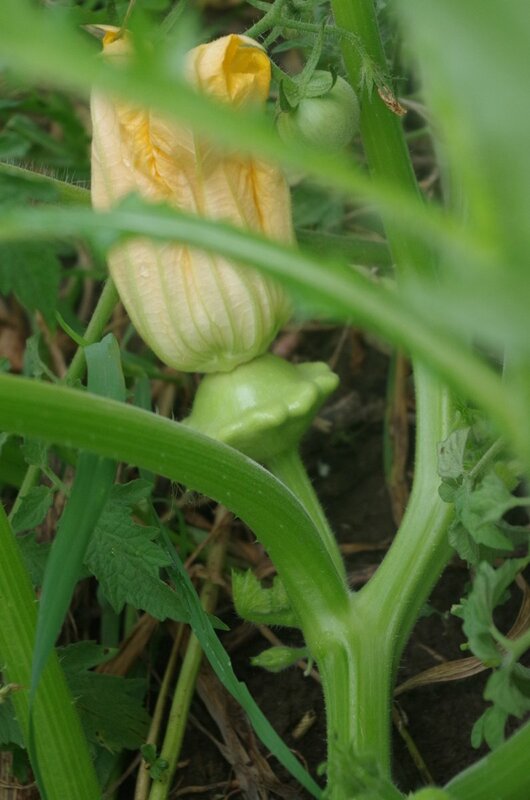 If you’ve never seen this sort of zucchini around, it might be because the yields on the plant are significantly lower than more modern varieties, making the variety less profitable. Personally, I’ll trade quality for quantity any day. My favorite way to eat this zucchini is in spaghetti sauce. Just slice the zucchini into rounds about 3/4 inch thick and quarter the slices so you have little chunks. Saute in olive oil with a little salt, garlic and maybe red pepper flakes, until soft. Toss into your sauce and simmer for a few minutes. Eat over pasta and be happy! What’s that? On the market table? A UFO? A pumpkin? What??? It’s a Patty Pan squash! Scallop squash or Patty Pans are a summer squash variety with a mild taste and a delightfully smooth texture. They were developed by Native Americans and have been grown since before Columbus. The squash is described in European literature as far back as 1591 and accounts of it can be found in American texts throughout the 1700s! 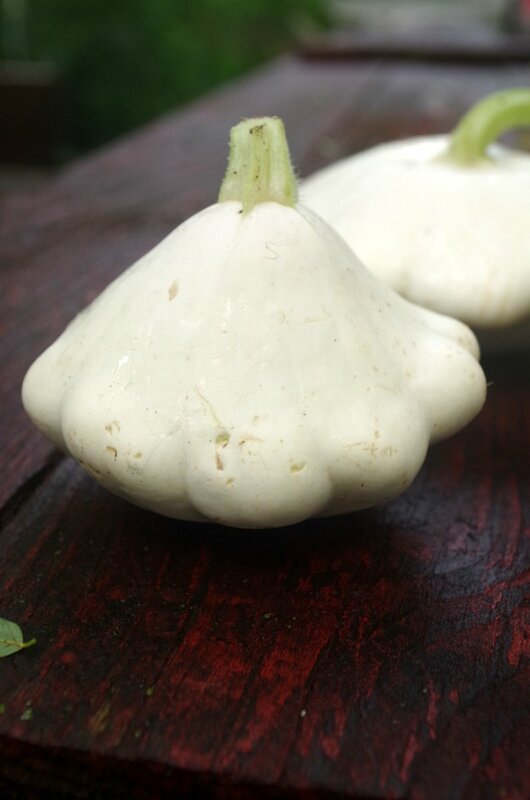 We are growing a white heirloom variety and have been so excited to meet people who have fond memories of this squash from childhood. About half the folks who see our Patty Pans have no idea what they are and ask us about them (never be afraid to ask a farmer “what is that? How do you cook it? How does it grow?” We love to answer those questions!). However, everyone who recognizes the squash smiles immediately. Experienced Patty Pan lovers seem to all agree that sautéing the squash in butter is the best way to enjoy it. We’ve roasted some in the oven, and I know folks grill them as well. The shape is also perfect for stuffing! The skin is thin and edible. This is my first year growing these little UFOs and I am totally smitten with them. They are so fun to pick and even more fun to display at the market. I hope you enjoy them too! Bill grew up in Central New York and we both went to college in Syracuse, so we both enjoy a regional food called Salt Potatoes. Ask anyone from the Syracuse area and they will get very excited about this local dish, associating it fondly with summer, fairs, and barbecues. It’s not complicated…just boil new potatoes in salty water (1 cup of salt per 6 cups of water) until they are cooked and soft. Serve with a little plop of butter and enjoy! Salt potatoes originated in the 1800s with the Irish salt miners who brought small, substandard potatoes to work each day and boiled them in the salt brine. Today, over one million bags of salt potatoes are sold annually in the area. We use our Red Norland new potatoes boiled in salt water to remind us of home. 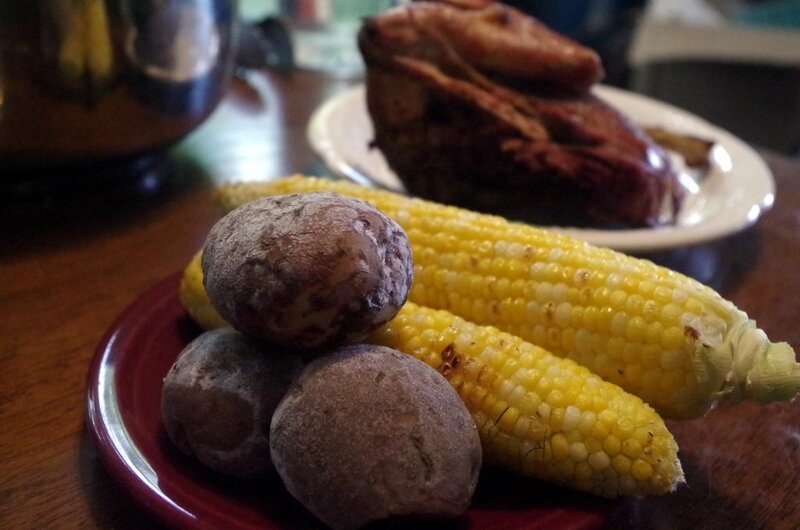 We hope you’ll give Salt Potatoes a try, too!